Occupy Wall Street: “We Own Wall Street,” a new movement to stop corporate America’s misbehavior. How small shareholders, pension funds, and mutual funds can stop corporate America’s worst behavior and ignite a political movement. As the year ends, American politics remains mired in the agenda of the right. The House is, at least momentarily, refusing to extend the payroll tax cut and unemployment benefits—two policies genuinely beneficial to the middle class. And the presidential campaign heading into the Iowa primaries is dominated by the libertarianism of Ron Paul and the astonishing, appalling ideas—eliminate child labor laws, for instance—of Newt Gingrich. Yes, Occupy Wall Street changed the debate for a brief spell, and, yes, President Obama harkened back to the glory days of progressivism with his Kansas speech. But in general American politics has lost sight of the most important crisis of our generation: the shrinking middle class. So let me offer some advice to Democrats and progressives seeking to capture the attention of the American people. It has long been my belief that ownership trumps regulation. What I mean by that is while laws and regulations can create boundaries to behavior, the reality, as we have seen after passing much legislation—Sarbanes-Oxley, Dodd-Frank—is that even good laws leave room for bad decision making that results in cataclysm. Even though prosecutors should have charged many more bad actors on Wall Street, much of what led to the crisis was not blatant illegality: It was horrific judgment exercised by senior executives and regulators. More laws and different regulations might have mitigated the disaster, but the best remedy, and the step we have to focus on, is giving citizens more decision-making within the private sector. “We Own Wall Street” should be the rallying cry of the former Occupy Wall Street, come January. We Own Wall Street is the truth. The actual ownership of major banks, manufacturers, and retail giants resides in vast repositories of capital that are owned and controlled by the public: mutual funds, public pension funds, and endowments at public institutions. If the public exercised its huge ownership capacity by influencing board member selection, compensation, and political donations, then these companies would be fundamentally altered. How to do this? It’s actually pretty easy. What’s needed is a bit of leadership. 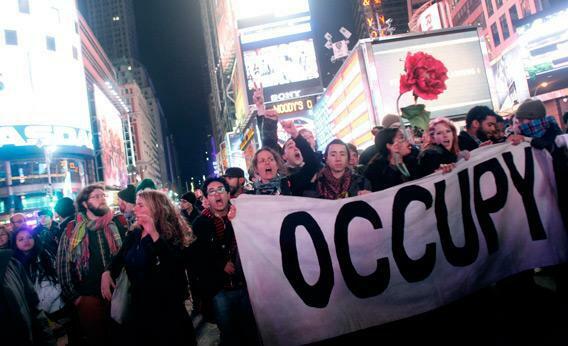 The current Occupy Wall Street could enlist a few savvy and courageous state and city comptrollers. The first steps should be easy, almost nonideological, to demonstrate the power of ownership. First, disclose the substance of, and all records relating to, any meetings between senior officers of the company and any regulator over the past five years. On behalf of the public and shareholders, we need to understand what happened in the regulatory process and why; we need to be comfortable that the company and government officials have been forthright with the public about the nature of the discussions that led to the massive flow of public funds to the company. Second, cease all giving of corporate funds to any entity—for-profit, not-for-profit, overtly political or not—that is involved in attempting to sway the course of legislation or regulation in Washington or any state capital. This would encompass the U.S. Chamber of Commerce as well as the Sierra Club. The idea would be to slow the cascade of money and influence flowing into politics from inside the corporations. As owners we are saying: Stop trying to alter the rules you play by. Just play by the rules and focus on building a better product. There are many more substantive policy areas where a minority group of shareholder could alter corporate behavior for the benefit of both the company and the public, but it seems easiest to being with these steps relating to the bailouts and lobbying. The effort to reassert proper ownership need not be an argument from the left or the right. It is merely an effort to move responsibility and power back to where it belongs.